The Uncurated Life: FOREVER 21 coming to MNL??? FOREVER 21 coming to MNL??? Can you image a store like this inside Megamall????? grabbed photo here. thank you! I was walking around SM Megamall awhile ago when I noticed that a store is blocked like it was being renovated. I think it was the Cinderealla boutique before. I tried not to heed the blocked store but when I noticed "FOREVER 21" with a date that says "JUNE 2010", I freaking got giddy! I can't believe that it's happening!! I don't care how much plus they have to put on the price, I just found my motivation to jog every morning and every night... to fit in those skimpy bodycons, tulip skirts or whatever else is offered in the FOREVER 21 store in Manila. I must lose weight and work doubly hard in order to get my hands on some of the fabulous pieces of FOREVER 21! Don't even get started on the accessories! To.Die.For! Although I'm all for patronizing Filipino products, I can't deny how fabulous FOREVER 21 clothings are. 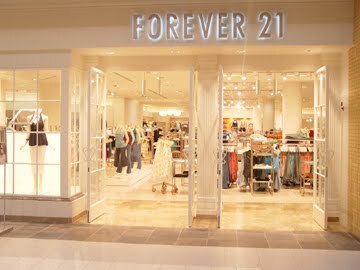 I'm not saying I'm going to be a hoarder but I'm definitely going to get my first piece of FOREVER21 as soon as it opens on JUNE 2010! And a piece every month after (fingers crossed!). Naloloka pa din ako!!!!! Sa wakaaaassssss!!!! If it's the original Forever21 in the US, then this is really good news! I love their clothes, too! The Forever21 we have here in malls are just copycat versions. IF IT'S THE REAL F21 I CAN'T WAIT FOR THE SHOES. I am so so sooooooo excited. Hmmm...There are Forever 21 stores locally already (there's one in Megamall and antoher in Galleria) but they don't carry the same merchandise as the F21 stores in the US. So I'm not sure if this is the same thing. I sure hope so, because Forever21 is one of my absolute faves also! yep, yung totoong f21 na talaga yan, last year pa nabalita. next month na pala, finally! love their accessories! I hope they pick the stuff that they'll bring. Forever 21 has some really good finds, but a lot of misses too. @bellebathandbeyond I think you're referring to the copycat 21 Forever, not Forever 21, haha. If this is the original, I SO can't wait for it to come! Sana nga. It's still not on the list of Forever 21 stores in their website eh. OMG, love their accessories... sana hindi masyadong mahal dito! wow! I'm freaking excited for this! Another reason to shop more in Mnl. i've been waiting for this for like almost all of my life!!!!!!!!! cant wait for it to open yey! !